Cuba’s health professionals abroad totalling almost 373 thousand have offered their medical aid to 162 countries since its first colaboration to Chile in 1960. Dr. Regla Angulo, Director of the Medical Colaboration Center told ACN that Cuba currently has over 42 thousand health professionals in 54 countries. She highlighted the Henry Reeve International Contingent of Specialized Doctors in Disasters and Serious Epidemics, created on September 19 th, 2005 by the leader of the Cuban Revolution, Fidel Castro which has been present in 21 countries with 24 medical brigades. Most recently, made up by 23 health professionals the medical brigade offered its services for a period of 2 months to the Peruvian people in the area of Piura where the population has been affected by intense rains. The medical contingent has assisted over 24 thousand patients of these 987 confirmed cases of dengue and without any casualties reported, said Dr. Rolando Piloto, head of the team. Among some of the women also present in the medical team is the specialist on Hygiene and Epidemiology Angela Estrella Caramalleta who works in the Provincial Hygiene and Epidemiology Center in Guantanamo. She told ACN that this was her first mission and she is dedicating it to Commander Fidel Castro, President Raul Castro, and the Cuban Communist Party, the people, family and neighbors which in some way have also cooperated. Angela said she would like to say so much but is satisfied with their responsibilities. 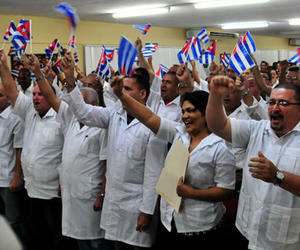 She added that the Cuban medical group will remain in the hearts of the people of Piura and the local authorities. The population totally lacks the medical services and were desperate; but wherever we arrived we respected the protocol that they have in place and with our work the situation was under control, she said. When the Cuban medical brigade left, many people cried and wanted us to stay, said the epidemiologist from Guantanamo who along with other members of the Henry Reeve contingent assisted the population suffering from dengue, skin ailments and others. The Henry Reeve contingent has offered medical assistance to over 3.5 million people and has saved over 80 thousand lives, according to Cuban Health Minister Roberto Morales Ojeda during the 17th World Health Assembly recently held in Geneva. The Cuban Health Minister together with Dr. Felix Baez, who contracted Ebola in 2014 during his participation in the Henry Reeve Brigade in Sierra Leona, received the Lee Jong-wook Memorial Award granted by the World Health Organization, WHO.